This past weekend, my kids and I went up to Qualicum Beach for two nights. We Always Stay at the Qualium Bay Resort! It was like a second home to me when I was growing up in North Qualicum. I had my first job there at the ‘Cone Zone’. Now, it’s a place my kids and I go and stay when we go up to Qualicum to visit family and friends. My kids and I switch around between the ‘camper cabins’ and the cottages. I prefer to stay in the cottages during the fall through the spring (because the cottages have more space, a shower, and a pull out bed that doubles as a very comfy and spacious couch). And in the summer, the kiddos and I prefer to stay in the camper cabins. We have stayed in all 3 types of camper cabins and the deluxe ones are our favorite! The most basic camper cabin was more than enough in the middle of summer. The most basic camper cabins come with a mini fridge, 2 burner stove top, a bunk bed, and chairs for 2. It was fine for the middle of summer since we weren’t spending much time at the cabin anyways. The Large and Deluxe cabins are my favorite though. Both Large and Deluxe come with a double size bed, a sleeping loft (with fold-out sleeping mats), a TV, table and chairs for 4, a toilet room, a small kitchen area to prepare food, a 2 burner stove top, fridge and freezer, a sink with cold running water, and a couch. My kids found the deluxe cabins the most exciting because of the sleeping loft. They are also very affordable 😀 Not only do they have the cottage and camper cabins, the Qualicum Bay Resort has RV spaces with water and sewage hookups, as well as tent spaces and motel rooms! On site is the ‘Cone Zone’ & convenience store. It’s usually open in May or June until early fall. For more info or to book a stay, visit the Qualicum Bay Resort website. One of the days we were up island, the kids, my parents and I went to Mt. 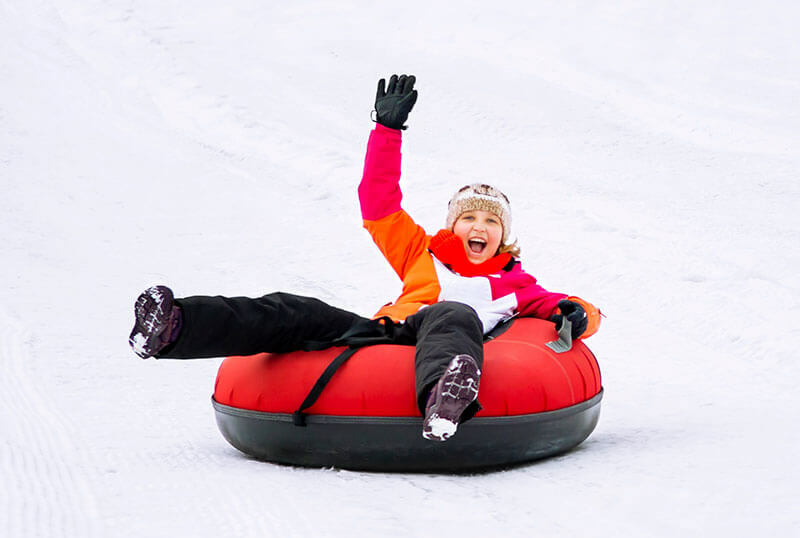 Washington to go snow tubing. We go every year. Mt. Washington has it set up now where you purchase a tubing session by the hour. So for example the kids and I went tubing from 11am-Noon. For kids it’s $14.00 per hour (ages 2-12) and 13+ is $18.00 per hour. The lineups are minimal and there are 4 lanes to choose from. It’s safe and a TON of Fun! For more information on lessons and rentals visit the Mt. Washington website.